This middleweight mix is designed for small- to medium-sized container crops grown indoors and out. It contains aged bark to provide added structure and drainage to the mix. 2.8 cu.ft. A heavyweight mix with a high volume of bark, Fafard® 3 Mix is suited to most container sizes, large or small, and is recommended for both indoor and outdoor production. 2.8 cu.ft. As its name suggests, this is a super fine mix recommended for seed starting, plugs, cuttings and a variety of bedding plants. 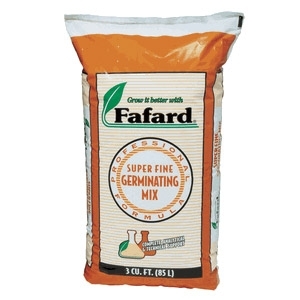 It contains added plug-grade perlite and vermiculite for increased porosity and water retention. 2.8 cu.ft.